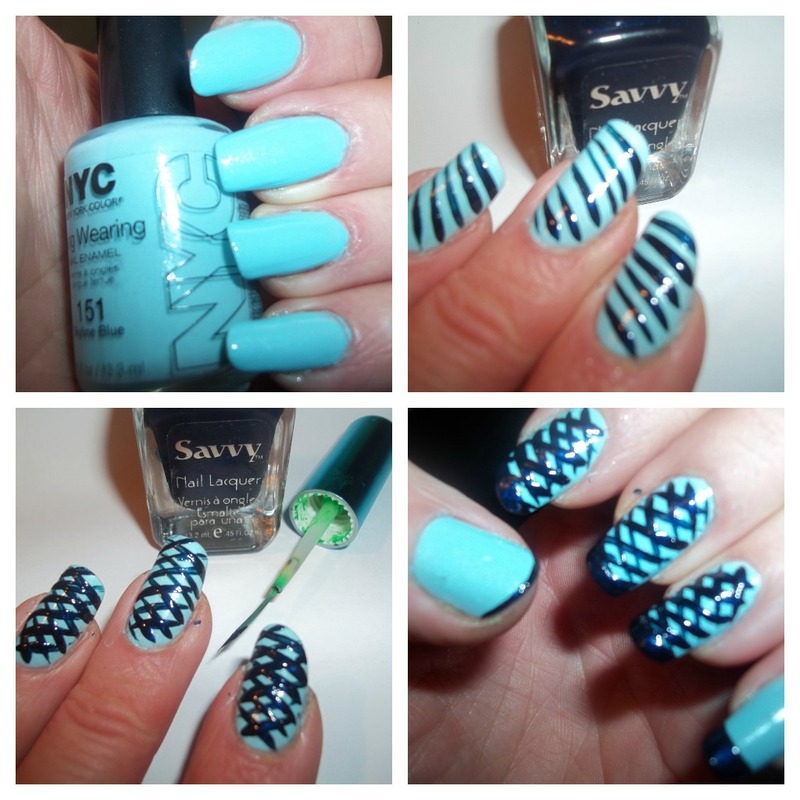 I chose shades of blue & green for my gradient. Then the lightest shade.NYC Skyline Blue at the tip of the nail. 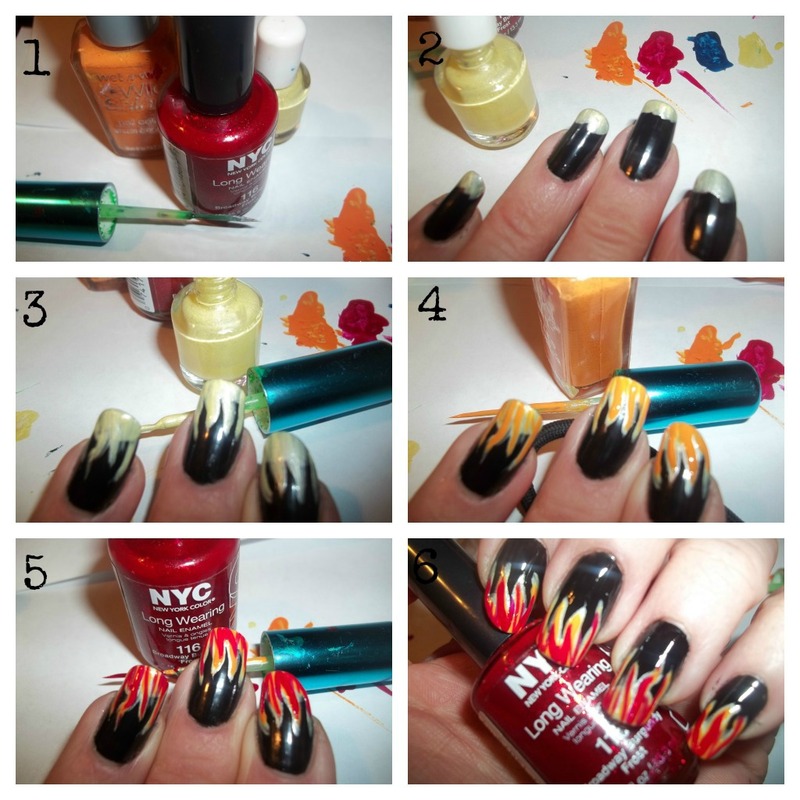 Then use your Art Deco nail art brush in black for the animal stripes. Then finish off with a glitter to match.Rue Beaute'.No shade is listed on the bottle,however it's filled with green/gold & blue glitter. I started with my base color black. Then apply your yellow to the ends,and it doesn't have to be perfect. Then taking your yellow again start creating thick whispy lines upwards. Then take your orange and place inside the yellow trying not to fully cover the yellow. Then your red doing the same thing. 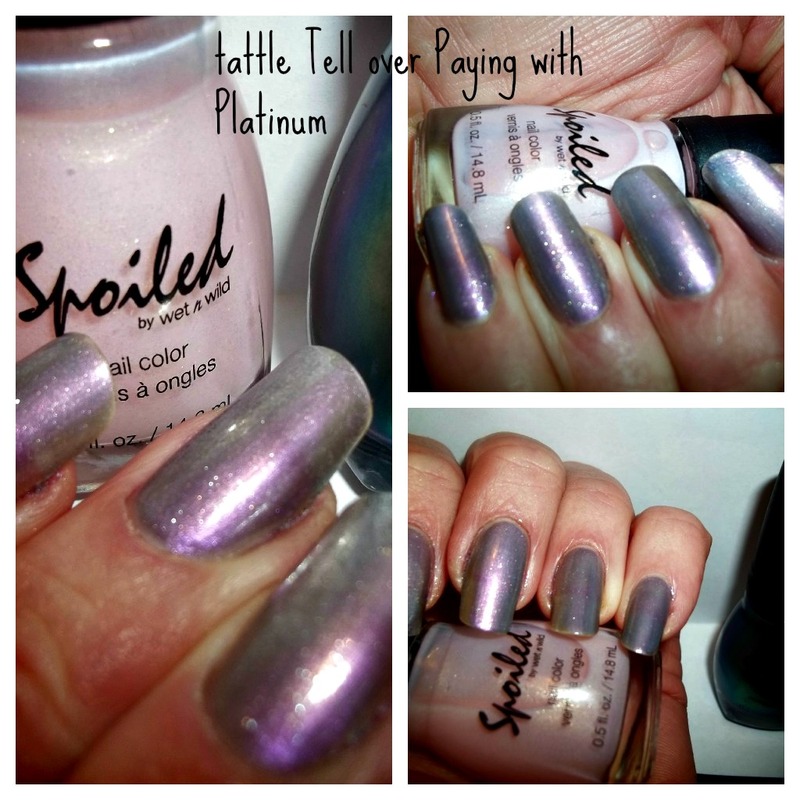 Apply a base coat.I chose Spoiled "Tattle Tell"because it's somewhat sheer with a nice shimmer. Then start with your next color.I chose orange. 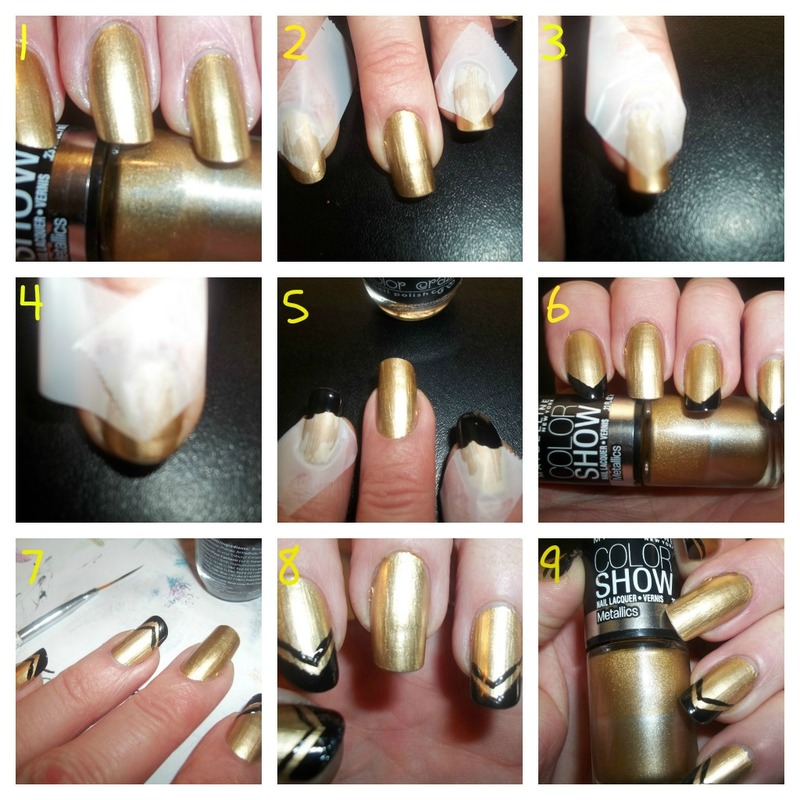 Then top it off with a shimmer top coat. Start with a red base.I chose NYC"Broadway Burgundy Frost"due to the fact it has a nice shimmer and I did not need a top coat. Then using a small nail brush or Art Deco in green to create the stem. 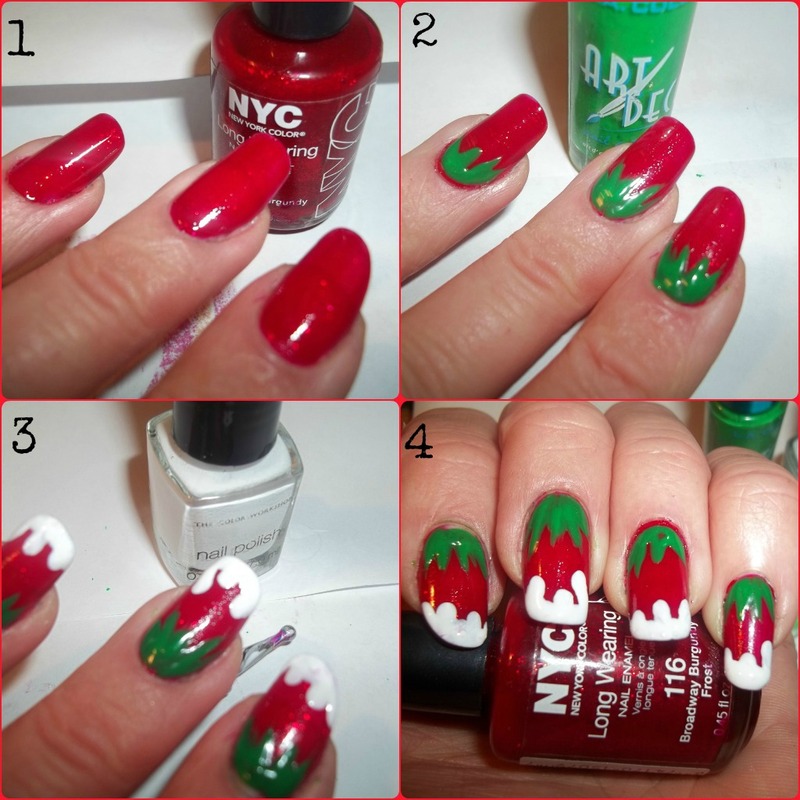 Then using a dotting tool apply your white at the tips for the whipped cream. Viola♥Strawberry Nails covered in whip cream. 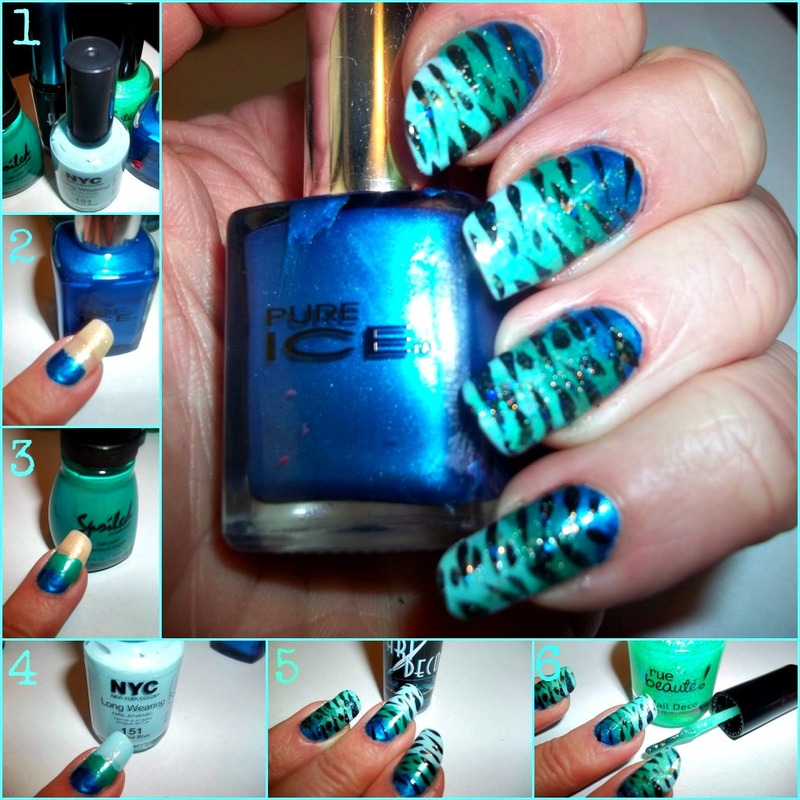 Start with your favorite base color.I chose NYC "Skyline Blue"
Then using a small nail brush or use one from L.A.Colors Art Deco,which work quite well. If your not too great at creating straight lines try setting your brush on the edge of the nail,and instead of moving the brush try rolling your finger from left to right or visa versa while holding the brush down.This works great. 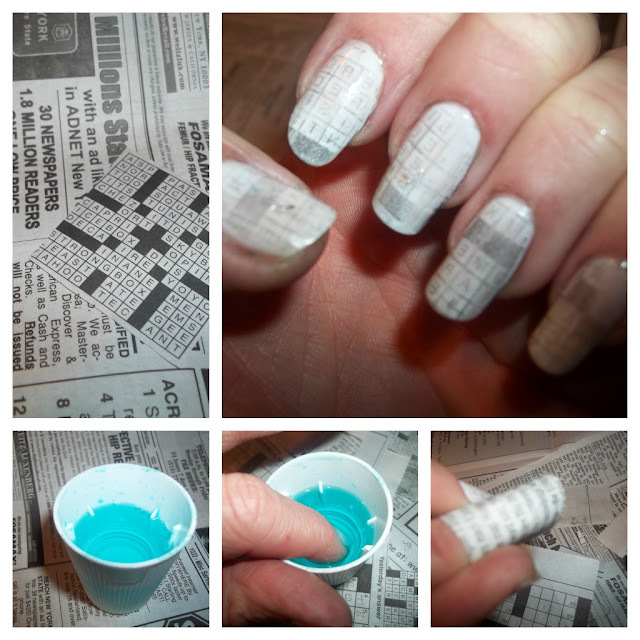 I chose L.A.Colors "Circuits/Black,The Color Workshop"Basic brown" & NYC"Skyline Blue",and you'll need a dotting tool or a small nail brush.Using a dotting tool I found is easier to manuever. My base coat is Wet n Wild "Sage in the city" which I love this shade of green. Then using your dotting tool make random splotches on the nail.I started with the blue. 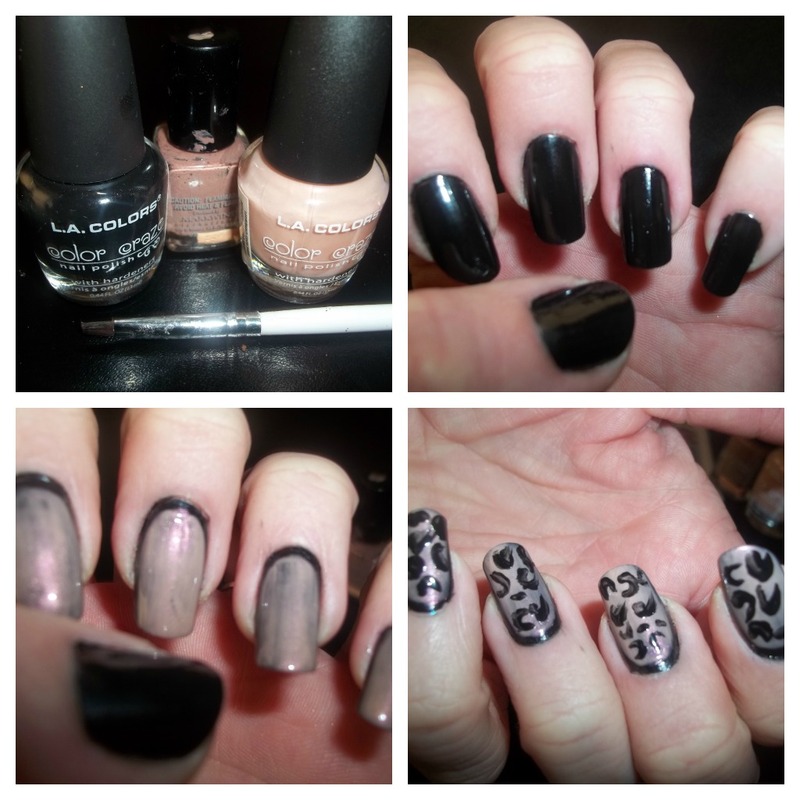 Start off with two black base coats. 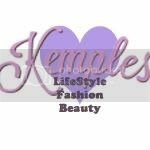 Then using your the lighter shade L.A.Colors(Mega Watt)apply over your black only on the inside of the nail,and going to the edges. Then fill in the C's with your next shade brown. 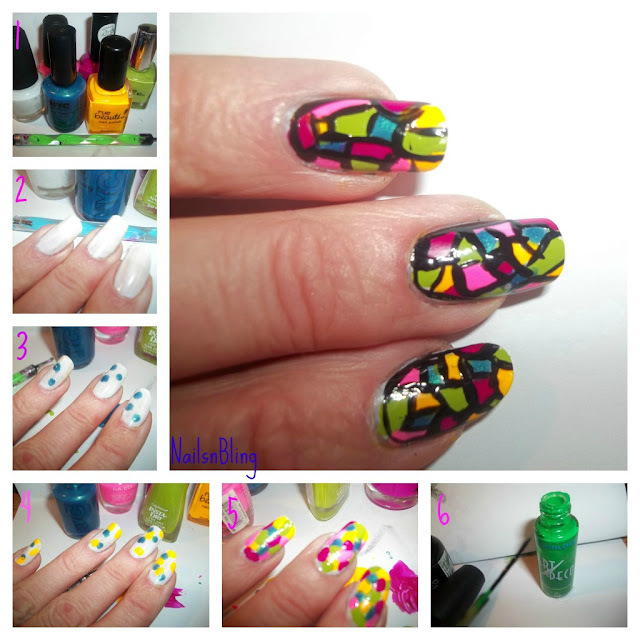 This is my first attempt creating the stained glass look on my nails,and I thought I did pretty well.You definitely need a steady hand which in fact I do not have,and patience which I don't have much of that either. First start with your choice of colors and you'll need a dotting tool.I chose my largest one. Choose a base coat or a clear coat will work.It'll be covered anyways. Then create random dots or shapes.Some dots I made bigger than others,and try to put your colors fairly close to each other. 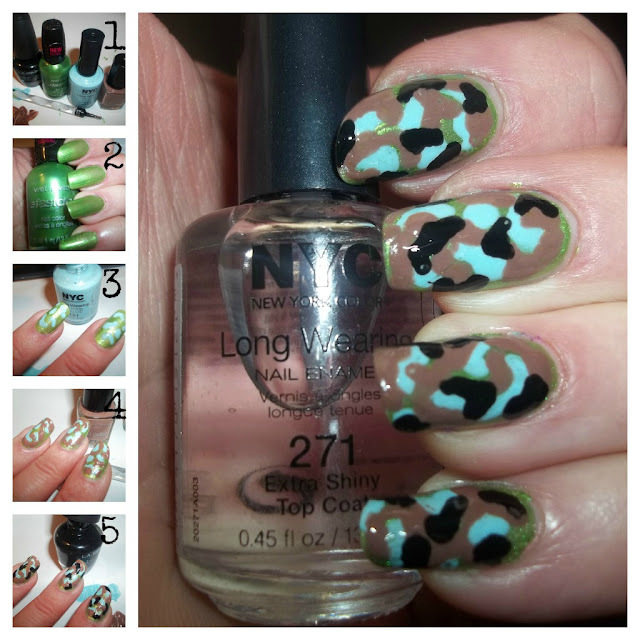 Cover most of your nail with different dots and shapes.Let it dry completely before starting your outlines with black. Then using a nail art brush,draw lines around your colors to separate.What I found worked great is the brush from Art Deco.Just clean it off with some polish remover and dip into your black polish.I happen to not have a art deco in black so I used the brush from the green.This brush is perfect for going around colors and creating thinner lines. 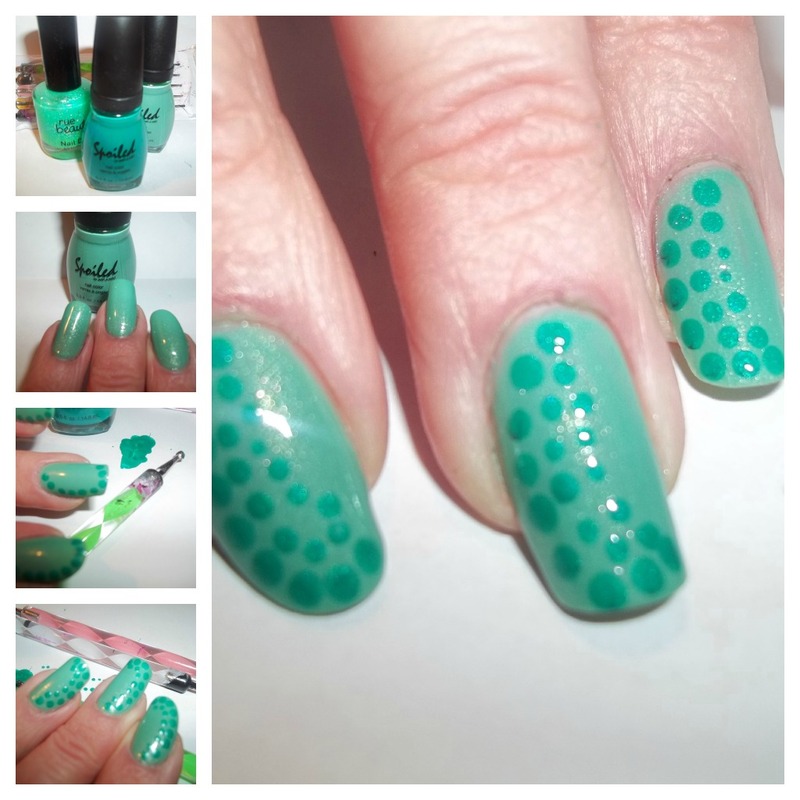 What can I say I love creating polka dots,and they're so easy to create with your dotting tools. 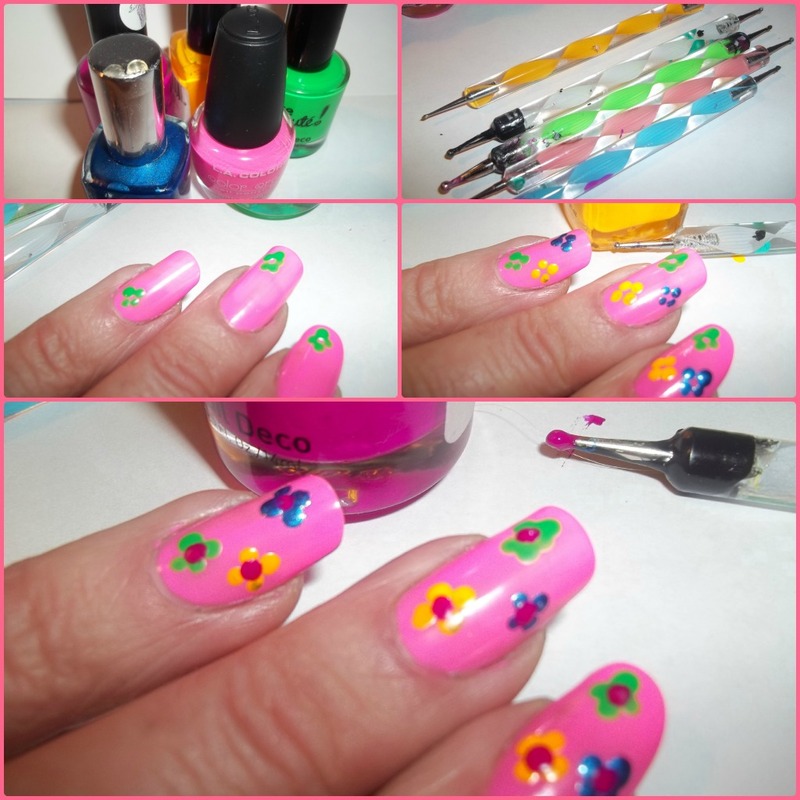 Flowers are cute & easy to create on your nails. So I went out and purchased two more shades of Spoiled by wet n wild since they are still on sale at CVS for 2/$3.Then with my coupon for $1 off makes them 2/$2.Sixty seven shades left to go. 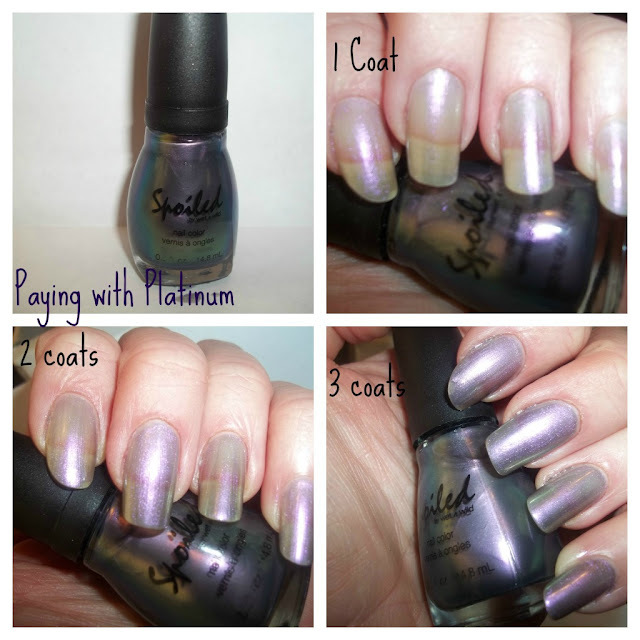 Love the name of this one "Toad-ally Amazing"
Two coats covered nicely.More shine with this one and a bit of shimmer. This one is a much deeper,darker shade "Distant Memory"with a touch of shimmer. The color here is lighter than the actual shade.Just one coat covers quite nicely,however it dries a little flat with a tad bit of shine. In this pic the shade appears even lighter.It must be my camera.Guess you'll just have to see for yourself! 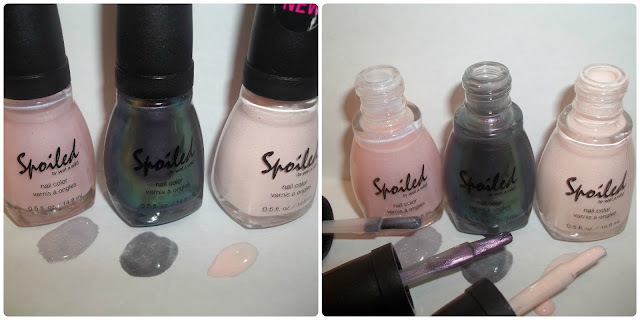 Spoiled from Wet n Wild offers 72 awesome shades at only $1.99.Plus right now Spoiled is on sale at CVS for 2/$3.00,and with your $1 off coupon from the redplum coupon booklet making these 2/$2.So I purchased the first three that caught my eye.Sixty-nine left to go! Paying with Platinum is an awesome shade.It looks green then purple.I love the shades that look like one color one way and another color another way. Shade "My Button Fell Off" This polish went on a bit streaky at first with the first coat.It took three coats for complete coverage.It almost looks white,however it's a very pale shade of pink.